This combination of lightly set, silky-smooth coconut custard and tangy lime syrup is utterly divine. Both can be made hours in advance, ready for taking to the party. Preheat the oven to 200ºC, gas mark 6. On a surface dusted with icing sugar, thinly roll out the pastry and use to line a 23cm round, loose-based tart tin with a 4cm depth. Lightly prick the base with a fork then line with baking parchment and fill with baking beans. Blind bake for 20 minutes then remove the beans and paper and bake for a further 5 minutes, or until the pastry is golden and 'sandy'. Remove the tart and allow to cool. Reduce the oven temperature to 150ºC, gas mark 2. To make the filling, pour the coconut milk and cream into a medium, heavy-based saucepan and heat until almost boiling. Beat the sugar, cornflour and egg yolks in a bowl and whisk in the hot milk. Carefully pour into the pastry case. Bake for about 50 minutes. The custard should still be very wobbly in the centre but it will set further as it cools. Meanwhile, finely grate the zest from 4 of the limes. Remove and discard the skins from all the limes with a small, sharp knife and thinly slice the flesh. Place the sugar in a small, heavy-based saucepan with 150ml cold water and heat gently until the sugar dissolves. Bring to the boil and boil rapidly for 4-5 minutes until slightly syrupy. Add the lime zest and slices and transfer to a bowl. Leave to cool. Transfer the cooled tart to a flat serving plate. Dust with icing sugar and serve in wedges. Decorate with the lime slices and drizzle with the lime syrup (serve the syrup at room temperature or gently warmed). To get ahead, prepare the pastry case and lime syrup the day before. Assemble the tart a couple of hours before the party, to allow the filling time to cool. 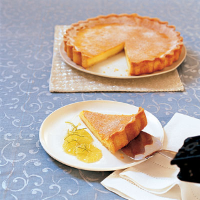 To transport, transfer the tart to a serving plate and place in a cake tin or large container; don't dust with icing sugar until ready to serve. Place the lime syrup in a container with a tight-fitting lid.